Endorsed by the top Chinese player No.1 in the world – Liu Shiwen, the Butterfly Liu Shiwen LSX5 is an advanced table tennis bat made for quality play, suitable for dynamic and aggressive style of table tennis. The bat is designed for upmost spin potential and incredible speed, yet also it provides a decent level of control over shots, it features an ultra-sturdy 5-ply wood blade secured with edging tape for extra protection from impacts, and features an anatomic shaped handles for maximum comfort and smoother manoeuvrability. The bat features a red and black Wakaba ITTF (International Table Tennis Federation) approved rubber – 1.8mm dense for a masterful responsive feel and impeccable consistency on long rallies. 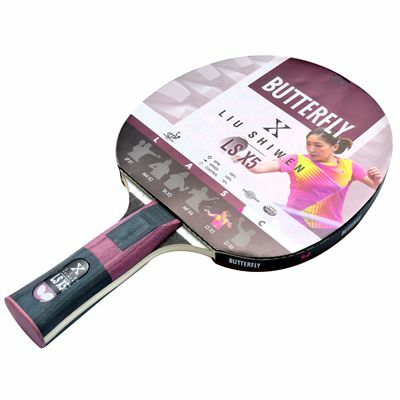 for submitting product information about Butterfly Liu Shiwen LSX5 Table Tennis Bat We aim to answer all questions within 2-3 days. for submitting product information about Butterfly Liu Shiwen LSX5 Table Tennis Bat. We aim to answer all questions within 2-3 days. If you provided your name and email address, we will email you as soon as the answer is published. for submitting product review about Butterfly Liu Shiwen LSX5 Table Tennis Bat.